Star fruit. Carambola. Whatever you call it, the sweet-tart fruit is a rare treat if you live in a non-tropical climate. In the Washington, D.C., area in February, carambola can be purchased for $2 at local grocery stores. $2? For a little fruit that won’t taste half as good as it does when enjoyed right off of the tree? No thanks. When Stacey’s husband returned from a trip home – home is Puerto Rico for him – with a gallon-sized zipper bag of carambola, she was delighted! What goes for $2/piece in our area gets dropped off at Stacey’s in-laws’ house by the garbage bag. For free. Carambola – and mangoes and coconuts – can be found littering the streets on the Isla del Encanto. The abundant fruits just can’t be eaten or frozen quickly enough. We like to eat carambola when they’re mostly bright yellow with a bit of green. The more mature and yellow the color, the sweeter the fruit. A young, green star fruit will be much more tart. And as much as we like to enjoy them fresh, this time around we decided to celebrate our good fortune with a recipe. A recipe for delicious sorbet! But then we realized that sorbet is not exactly an instant-gratification kind of treat. First we had to freeze the ice cream maker (we use the bowl that attaches to the Kitchen Aid mixer), a process that takes at least 15 hours. Solution: granita! In a blender, puree 400 grams carambola, about 1 cup strawberries, ½ cup sugar (or more, to taste), about ½ cup water and 1/4 cup 100% juice pomegranate cocktail juice (white grape juice would also be tasty). In lieu of juice, you can add more water or some milk or whipping cream. Blend until the sugar is dissolved. Taste the mixture along the way and add ingredients to get desired flavor. Stir in a shot of vodka or rum – we used Puerto Rican Don Q rum – so that the mixture doesn’t get too hard in the freezer. If you want to make sorbet, put it in the ice cream maker for about 20 minutes. To make a granita-type dessert instead, pour the mixture into a freezer-safe bowl before freezing. 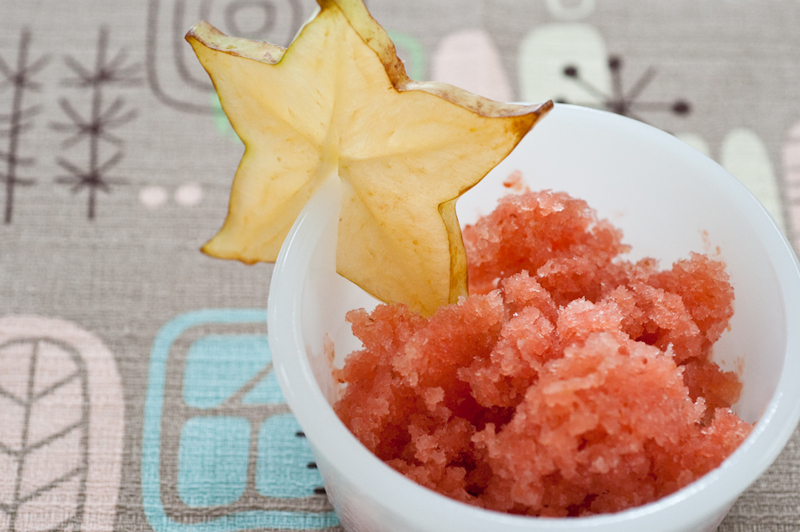 A real granita requires scraping every hour, but that step wasn’t necessary for this recipe. Carambola are low in calories and provide a good source of fiber. As with other tropical fruits, they are high in Vitamin C.
Have you cooked with carambola? 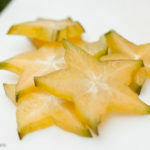 Do you like star fruit? Have you moved away from home and pine away for a particular local food? Editor’s note: Some of you might be wondering how we got the fruit back to the States without getting detained by TSA. It’s true: the US Department of Agriculture prohibits travelers from bringing produce, plants and other items from the Caribbean lest they contain pests that could infect our animal and plant population in the continental states. BUT! The exception to the rule is for processed foods, and sliced fruit falls into the “processed” category. 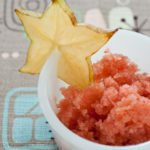 "so where are you from"
I’ve eaten carambola only a few times–they’re hard to find in Vegas–but they’re so beautiful I don’t know if I could bear to blend them up into a granita.